How would you (and your kids) like fluffy sourdough pancakes for breakfast every morning? My boys love it! It's our favorite breakfast. Since this method is quick and easy — not to mention delicious and nutritious — it's totally doable! And it makes fluffy-beyond-your-wildest-dreams pancakes! I also love getting all of my batter cooking at one time. Sitting with my family to eat breakfast is always fun. If needed, experiment with this recipe a few times to perfect your level of heat and cooking time. Believe me when I say that your efforts will be rewarded with smiles and empty plates. So good! I like to serve my pancakes topped with homemade yogurt and maple syrup or fresh/frozen fruit. That way we use less sweetener. I also use a pizza cutter to slice the leftover pancakes into wedges. Perfect morning snack or take along treat in the car/stroller. My husband and boys enjoy the leftovers plain, straight from the fridge or toasted warm. They make an excellent base for nut butter and jam or honey. This recipe is included in our Sourdough eCourse and eBook. Heat cast iron skillet on stovetop. I turn my electric burner to level 3 (of 11). I want my pan hot, but not too hot or the bottom of the pancake will burn. If you don’t get a perfect golden brown the first time you try this method, take note of what you did and make a change the next time. While the skillet is heating, take a medium size bowl. 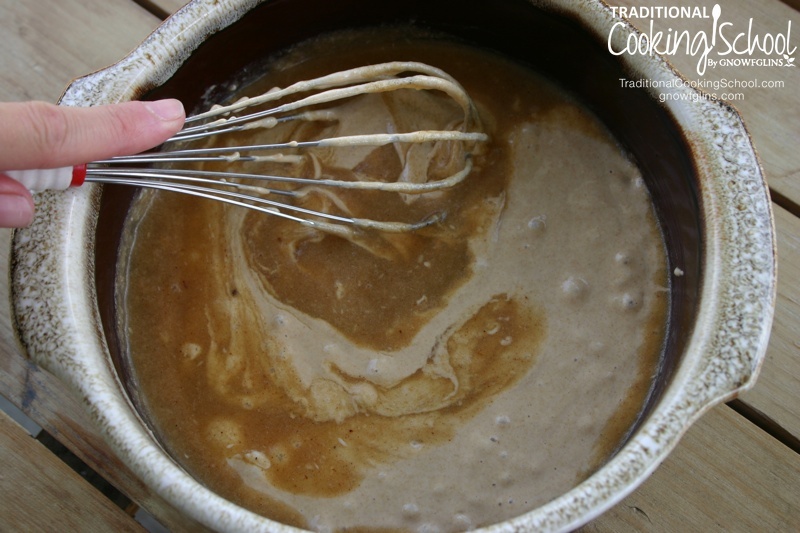 Whisk together melted coconut oil, egg, salt, sweetener, extract, and spices. Then pour in sourdough starter — make sure it has been fed the night before. Stir well with whisk and set aside. In a small cup, combine water and baking soda. Set aside. Then grease the bottom and sides of hot cast iron skillet. Pour the water/soda mixture into your waiting pancake batter. Stir to incorporate. Then pour the batter into your waiting skillet to about a 1-inch thickness. Instead of letting your batter sit while waiting for skillet pancake to finish, I recommend baking regular griddle pancakes in the meantime. I make 1 large and 1 small cast iron pancake and 2 griddle pancakes. Now, watch for bubbles. I let mine cook for 4 to 5 minutes on the stove. If you choose, now add fresh or frozen fruit by pressing it into the batter. Toward the end of this initial cook time, I turn on the broiler. Finish your pancakes off in the oven. Do not use the very top shelf. The 2nd or 3rd shelves work best. Remember, your pancake bottom will continue to cook while the top cooks and browns. Remove from oven once tops are golden brown. Finally, flip onto a cooling rack. Combine all spices in a small jar. Use whenever the need arises! Enjoy! When you try these, be sure to let us know how you like them (because you will)! This is a great variation of the original Alaskan sourdough hots! thanks so much! Be sure to add the soda very last minute and have a big enough bowl! Wow! I made the griddle pancakes (don’t have cast iron skillets) today and they were amazing. My starter is two weeks old so I’m still very new to this but a successful no-knead loaf and pancake breakfast later, sourdough is here to stay. My two year old daughter was skeptical at breakfast but had 1-1/2 for morning snack and went looking for more this afternoon….but mommy had eaten the last one! Thanks so much for doing what you do. Your website has been my reading material this week during nap time as my goal is to continue to transition our family into a more traditional way of eating. I made these this morning and they are absolutely delicious! I burned the bottom a little, so I still need to work the temperatures out, but this will definitely be a keeper for us. My husband especially enjoyed them. Thanks for a great recipe! My favorite was putting a mixture of 1/2 plain yogurt and 1/2 vanilla yogurt on the pancake, topped with nuts and seeds (fruit would be good too) ~ it was just like dessert! Our cast iron skillets must not be seasoned very well, because I had trouble getting them out; I’ll have to work on that. Thanks so much! Can I post this on my facebook page? I have friends who would love this! I made these with brown rice sourdough. They were soooo good. I’m the only one home today, so I halved the recipe — but I ate every last crumb! I didn’t have any eggs, so I added ground flax. I topped it with butter, almond butter, and a little sorghum syrup. I’ll be making these again this weekend. Thanks so much! Oh, also, do you have any suggestions on where to get a good cast-iron skillet? We just made the griddle pancakes both times. *Did you feed your sourdough a sufficient amount the night before making the pancakes? *Did you heat your cast iron first and then butter it just before pouring in your batter? *Did you put the baking soda in at the very end, give it a quick all around stir and then pour immediately into your hot and greased cast iron? *Did it gain any height while cooking on the stove top? The baking soda should have caused it to rise. *Because the blueberries get a bit soft in the hot batter and under the broiler, it’s best to flip a fruity pancake onto a plate. It should fall out nicely because the cast iron has been buttered before hand. Thanks for the response, Erin! I fed it enough to have at least 2 cups for the recipe, but I did notice that I only was left with maybe a scant 1/2 cup of my starter. As long as I had some left, and as long as I had the amount for the recipe, I’m assuming it wouldn’t affect the pancakes, right? Actually, the cast-iron pancake was pleasantly fluffy, it was more so the regular pancakes that were so flat and seemed more soggy/wet/oily. Maybe I used too much oil on my griddle? I think I’m going to try this recipe later today with my “homemade” starter that is now 5 days old. The one I used for my first try was with a starter that I got off cultureforhealth a couple months ago that had not been cared for very well at first (I needed this ecourse at that time!) which I had then passed onto my mother-in-law and then later asked her to have some back again (for this ecourse! )… oh the fun it will be to compare the two and how they perform! Do you think that my lack of proper care for this starter back a couple months ago (which still does bubbly great now after my MIL cared for it so lovingly lately!) would affect its performance now? Sorry for the long comment…. I’m taking the sourdough course and tried these tonight. YUM! A double batch did not last long in this house! I even purchased the cast iron pan specifically to try this and to make the tortillas next week. Just wanted to mention that I did wait on my cast iron pan for the second batch and it came out just fine, maybe a little crispier, which was fine with me. This will become a favorite in the house, I’m sure. I made these this morning and ‘wow’ed my girls, they were amazed at the size and loved them, I felt my starter was runny also when I pulled it out last night and I added almost a cup of oats to help that and make oatmeal pancakes…I made mine on my cast iron pizza pan -I think it is a 14 in. I’ve gotten a lot of cast iron at Lehman’s General Store. It is located in Ohio (somewhere). When visiting my husband’s relatives, I got a cast iron wok and then when Rob went hunting in Ohio last year he came home with the pizza pan for me. What a blessing! I love cast iron!!!!!! Anyway, Lehman’s has a website you could look up. They’ve got a bunch of neat, odd things! Thanks for this great recipe! I made it this morning for a nice weekend, Daddy-is-home breakfast for a Daddy who just happens to be very sourdough-suspicious!! I made it with whole bananas I’d frozen in summer (I’m in Australia!) pushed down into the pancake and topped it with a banana caramel sauce I made (butter, evaporated cane sugar and mashed bananas cooked together in a small saucepan) and natural yogurt on the side. “Daddy” had seconds and said it was great, so did my nearly 4-year-old son, and my nearly 2 daughter ate it with lots of happy “mmmmmm, mmmmm, mmmm” noises! hazelaid mama- Go ahead and try substituting 1/4 c. applesauce or 1/2 a banana for the egg. It’s definitely worth a try, and you may end up creating your best ever pancake! Enjoy! I ended up subbing 1/2 a ripe banana for the egg (which ended up being a whole banana since I was doubling the recipe) and though it had a pleasant taste, it didn’t cook quite right. I don’t have a cast iron skillet but I do have a stainless steel pan that can go in the oven (Salad Master with removable handles) so I doused it with butter and followed the recipe as indicated. The only other difference is I put in frozen berries at the time suggested in the recipe. It never cooked through even though I left it quite a bit longer than it should have needed in theory. The taste was still delicious but it did not look like your picture a all…much more gooey in the center. I even flipped it over and returned it to the oven to try to cook some of the goo out 🙂 (That helped marginally) I’m wondering if the frozen berries & the banana just added too much liquid to the batter. I cooked up some on the griddle with and without berries and they were pretty good (less gooey but also a lot thinner). Do you think the problem is with the pan (i.e. not being cast iron) or the banana/berry combo? I definitely intend on trying again with eggs and omitting the berries to see how it works because the taste was quite good. Thanks for all your help! Severine- Sorry to hear about all the goo! I look forward to you trying them with the egg and no berries. Feed your starter a bit more flour than water the feeding before you make pancakes. A thicker batter works best. I think you are right as far as the added wet ingredients… sounds like it was a bit too much for the pancake batter. Thanks for the recipe! I loved the idea of sitting down with my family for pancakes. I’m sorry to say I found one flaw with it when I tried it a few days ago. We made them for lunch and between my four girls (all 5 and under) and I we didn’t have enough! We warmed up some frozen fruit with about 1/4 cup of maple syrup for the topping, added some sausage on the side. There were no leftovers to speak of. I still need to tweak the temps on my gas grill but we’ll definitely be making these again soon. 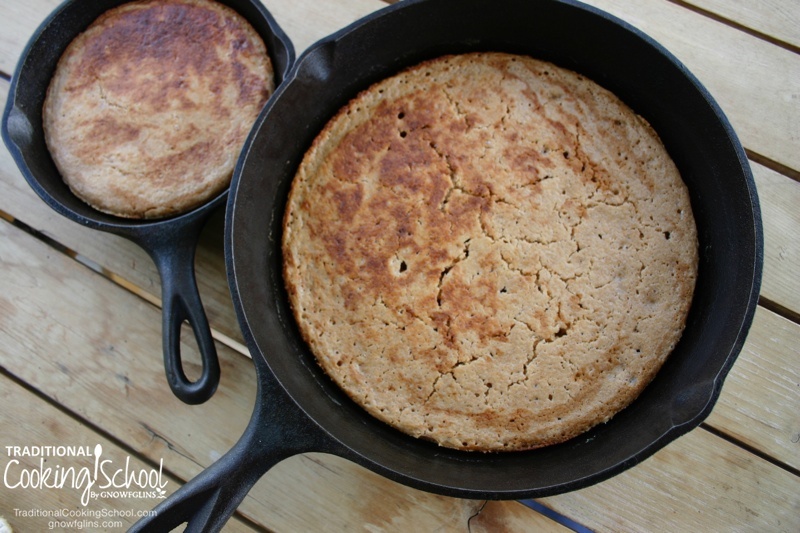 I think i am going to try the skillet cake instead of just the pancakes and do up a ton while the kids are out 😀 then I will have extra for lunches and hubby… though i doubt even that will last for long! I found your recipe through GNOWFGLINS and I am so happy I did! We are new to sourdough at home and eat pancakes often. I have tried a few different recipes now and I have to say yours is the best! Thank you for a delicious breakfast! We tried them today and will try tomorrow as well 🙂 We just used 1tsp honey and they tasted great, probably because we’re not used to eat too many sweet foods. Thanks! My Mother used to make us skillet pancakes, only she would put butter, brown sugar and sunflower seeds in the bottom of the pan. It would come out with a caramel like crust with yummy caramelized seeds. I’ve done it for my kids with rapadura instead of brown sugar, and also I have tried it with coconut instead of the seeds. Both are great. I also put a lid on top while it ‘bakes’ and it goes much faster. I never broiled it. We just flipped it over and ignored the white side. The lid allowed it to bake enough. But I might add, with the sugar added you have to cook it slower or it will burn. My mom used to cook it in one of those old square electric skillets (I don’t even know if they sell them anymore) so hers never burned. I made the sourdough pancake this morning, my wife had been mentioning a request for a few weeks, I usually make them on Sunday morning. She really likes them when they are fluffy and syrup-absorbent. Today is my bread making day and had not fed my sourdough, waiting for it to come to room temperature (during warm weather I refrigerate it), found your recipe this morning so the starter had not been fed, I still followed the recipe with the addition of a half cup of whole wheat flour. I was pleased when the baking soda started a rise, then pouring the entire recipe into skillet was pleasant, when bubbles appeared on the surface into the oven set to broil. Voila! The lightest pancake that I have ever made appeared, this all took less than ten minutes from finding recipe to pouring syrup. I have a small amount of tweaking to do regarding the timing and temp of stovetop portion, THIS RECIPE WILL FOREVERMORE BE IN MY REPETOIRE. Since we have eaten this 4 days this week, my husband said I needed to comment and say how good it was. We are just loving this recipe and even when my pregnancy and toddler mom brain take over, they still turn out great. I only get enough dough for my cast iron skillet – but I think that has more to do with my weak start. Thanks for this recipe. I love it. These were a hit this morning at our home in Oregon!!! My 2-year-old ate as much as my husband did!! I call that a win!! Everyone loved them and we are a big pancake family so I am extremely grateful for this real food alternative! Thank you so much Erin!! I used my baby starter (just four days old) and they were perfect!! The recipe filled my 12″ cast iron skillet beautifully!! Yeah Laura! Thanks for letting me know:-) Don’t you just love it when you find a nourishing food that is a hit with a two year old…and then the rest of the family as well! Enjoy your day, and thanks for the smile! Hi Erin! I did wait between batches just to see and the second batch was slightly less fluffy but oh so yummy!!! I am definitely adding this baking soda trick to other sour dough breakfast recipes. It makes the world of difference!! Hi Adam! So glad you enjoy the pancakes. I love their tasty flexibility. We enjoy them as savory treats by removing the honey and adding shredded cheese. Or my latest love… adding a good 1/4 cup of pureed pumpkin and a generous helping of cinnamon with a splash of vanilla. Delish. I’ve even been enjoying molasses as my sweetener lately, too. A tasty nourishing switch. 🙂 Thanks for your comment! I just tried these and they were sensational! This was the very first recipe I’ve ever made with sourdough starter that I started on my own and I’m glad this was the recipe I chose!! 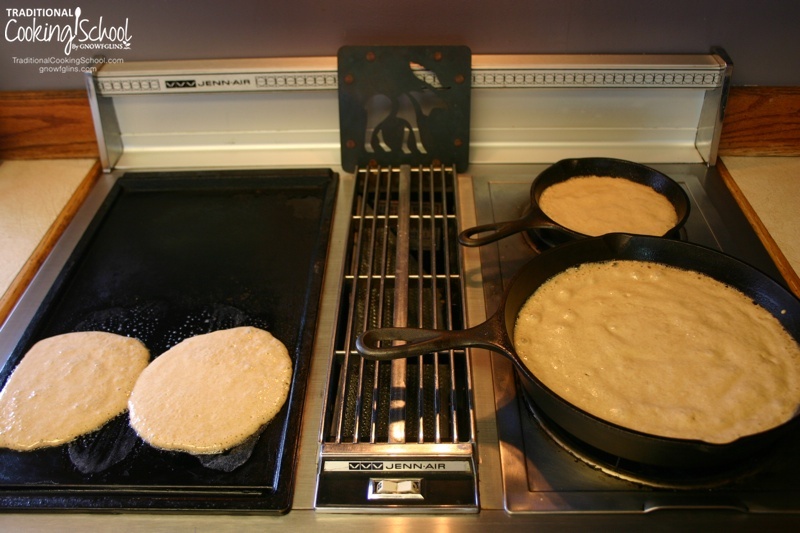 After my kids (and husband) wrinkled their noses–because they look different than the “normal” pancakes they are used to eating–they devoured the flat pancakes made on the griddle. I made two batches in the cast iron skillet and some on the griddle. They went for the flatter pancakes first and after I MADE them try the “pancake pie”, as I called it, they loved that one better. Silly kids/husband! Tasty Pancakes! Just made a variation using 1 grated pear, coconut oil instead of butter, 2 tablespoons honey, and about 1 teaspoon of cinnamon. Just had to share! So delicious! Seems like I’ve been making individual pancakes these days. 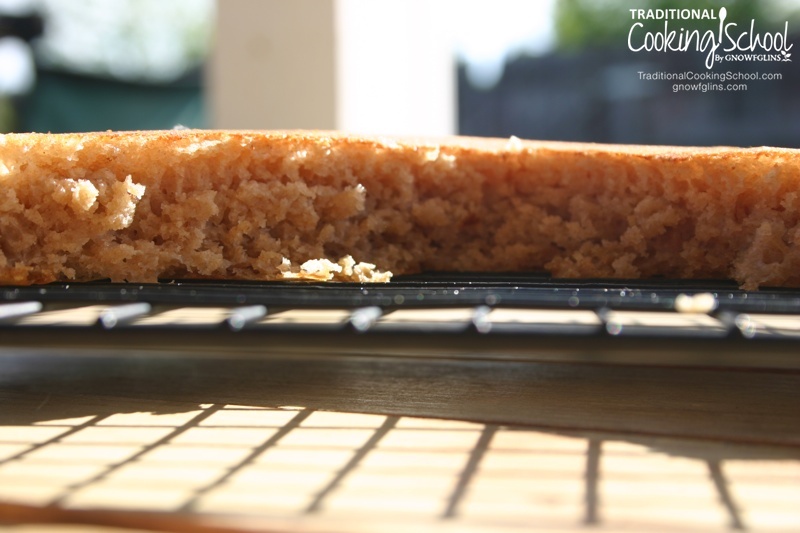 The left-overs make great sandwich bread or a tasty on-the-go snack! Can the skillet be baked the entire time? Thank you for the baking soda tip, this might help me with my ‘height’ issue. I use your spice mixture for other recipes as well, terrific as an addition to a meat rub, or for waffles. 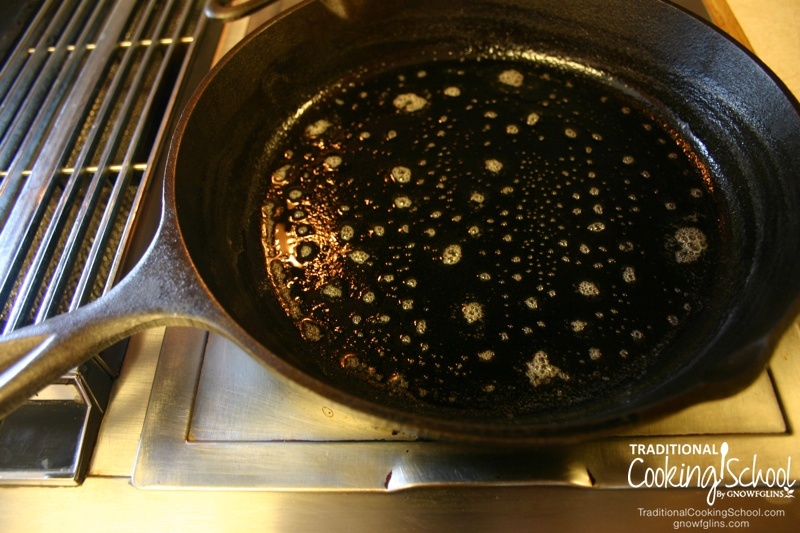 Put 1 1/2 T. butter in a cast iron skillet and place it in the oven as it preheats to 375 degrees F. Once preheated, take the skillet and swirled the melted butter around the sides and pour in the batter. Bake the skillet on the middle rack for about 8 minutes and then turn the oven to broil for 7-10 minutes. For the last minute, put it on the top shelf to brown a bit more if needed. Turn out onto a cooling rack. You may have to play around with the times, but this will let you know how it worked for me. Let me know if you give it a try! So I made these the other day and was really excited because the pancake looked gorgeous – perfectly browned, nice and puffy. The problem was the taste. It just tasted like baking soda to me. It left a really weird aftertaste in my mouth. I wonder if my baking soda could be expired? The dough didn’t rise much when I added the baking soda but since the pancake was still nice and fluffy I didn’t think it was an issue. But unfortunately I was unable to finish mine and had my husband eat it, who is good at eating things even if they don’t turn out well. 🙂 I have one more question – do you stir your starter before measuring it? It seems like every sourdough recipe is different in this regard, and I wasn’t sure if that was part of the problem. Thanks! Hi Kelsey- Hmmmm. Baking soda-y. That’s not good. First, I never stir my starter before using it. It has been freshly fed the night before I use it for pancakes. The thicker the starter, the thicker the pancakes. Are you sure you used just one teaspoon? 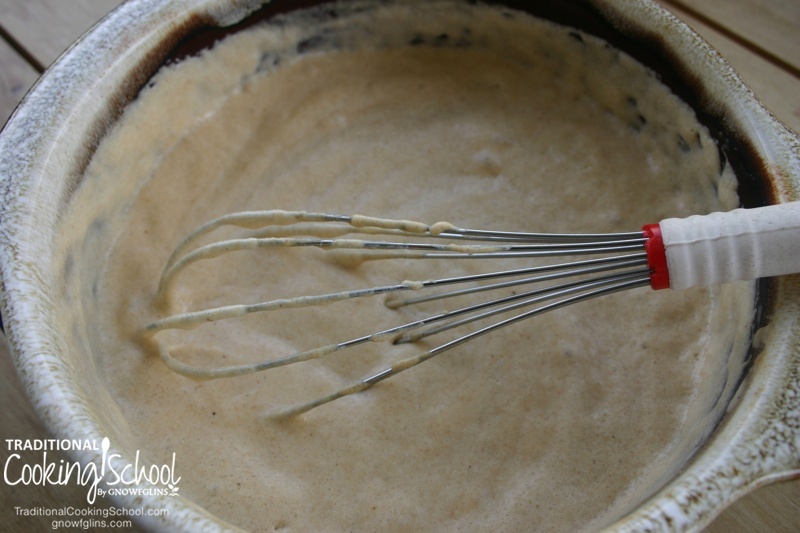 It is important to whisk it up really well once you sprinkle on the baking soda. What else? All the other ingredients were added? Honey, maybe some cinnamon, butter or coconut oil, 1/2 tsp. of salt, an egg, and 2 solid cups of starter? I’ve never had a problem with a baking soda-y taste, but, feel free to down the amount to 1/2 teaspoon. They should still work out just fine. Just curious, did you make the skillet pancake or individuals? I’d love to hear if you give them a go again, and how they turned out for you. Thanks for your comment! I *adore* this recipe. Since fall is upon us, I made these pumpkin this morning — added 1 C pumpkin puree and an extra tablespoon of maple syrup with the liquids and subbed pumpkin spices for the spice mixture! Sooooooooo yummy! I realized I never left a comment. I have been using these guidelines for a good way to use my sourdough. I did figure out that this batter substitutes well in my “magic pancake” recipe instead of normal complete pancake mix. I use cinnamon and nutmeg and add it on top of apples, pecans, butter and brown sugar that I microwaved in a pie pan. After adding batter I microwave the pie about 4 or 5 minutes (check for the center being done). It doesn’t look like much coming out of microwave but I flip it over on a plate and the apple/nut mixture looks great. Servewith home made whipped cream. This recipe would work in cast iron in oven but my original was microwave. It’s handy for sailing or camping. Thanks Erin for posting the fluffy recipe to give the rest of us inspiration. I’ve just begun my foray into sourdough and I’m absolutely loving it! These are the second thing I’ve made with my week-and-a-half-old starter (it’s adorable, by the way)—the first thing I made was English muffins…heavenly. I have to say, I am so beyond pleased with these pancakes. I made savory cakes instead of sweet, and cooked them Dutch baby style. I don’t have a cast iron skillet or something comparable that can go from stovetop to oven, so I adapted to the Dutch way. 🙂 I used two glass pie plates and melted ~2tbsp butter in each of them while the oven preheated to 350*F. I gave the butter another ~5min after the preheat to make sure it was good and sizzle-y, then I poured half of my batter into each. I baked them on 350 for ~20min and they are absolutely perfect. If you’re familiar with Dutch babies, these don’t puff up (think like a souffle if you aren’t familiar with Dutch babies) like usual, but the method works great if you don’t have an oven-safe skillet. I seasoned mine with cayenne, course-ground black pepper, sage, garam masala, coriander, thyme, and a few tbsps nutritional yeast to add in a little “cheesey” factor, and some dried onion. Oh.my.heavens. Just…divine! Baking soda = sodium bicarbonate? In Australia we have Bi-carb Soda and Baking Powder… Is it going to make a difference which one I use. 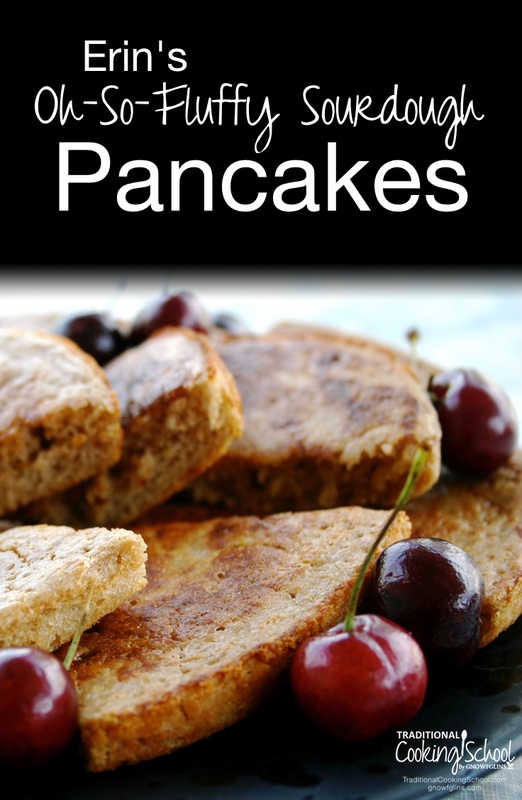 Hi Vashti~ Glad you are going to give the pancakes a try! Use the bi-carb soda. Enjoy! Maybe you could help figure out why my sourdough pancakes are cooking wonderfully but have a metallic taste? I heated these for 5 min on medium heat on an electric stove. Made the batter. Added Baking Soda -Water last minute.Greased the pan with coconut oil. Poured batter into hot pans. Cooked for 4-5 minutes on medium heat til bubbly and then placed in an oven preheated to 350F at the beginning and put on broil for one minute to finish off. The large one turned out great. The small one stuck and came apart. It wasn’t the dark brown top I see in the pictures so maybe a little under cooked. Maybe it had a minute less time on the stove than the larger one and a half a minutes less under the broiler. What excellent flavor and all like them very much. I ate the crumbled one ;o) Still was delicious. Oh, and thanks for telling us that the water is to disperse the baking soda evenly in the batter. I hate doing things I have no idea why I’m doing them. I absolutely loved these! And my kids did! I made them this morning and it came out sooo nice! I think I will have to make them more often now! Thank you so much for sharing the recipe! Could I make this with a starter that is aprox. 1 week old and made with white flour? Also, how much should i feed how much starter the night before? I am very new to this!!! Hi Teresa. This is a great recipe to use for just-beginning starters, and feel free to use whatever kind of starter you have going at the moment. Be sure to feed your starter enough flour and water the night before you make pancakes so that you can pull 2 cups from it for the batter and leave about a cup behind for future use. Enjoy your pancakes! I made my first batch of sour dough pancakes yesterday for Fathers Day … Daddy & Baby loved them (so did mommy)!!! Thank you so much for guiding me through 🙂 I was honestly a bit nervous, but your steps and video were awesome. Now I have to explore what else I can do with Sour dough!